With love, respect, and admiration. Thank you so much for your amazing art! 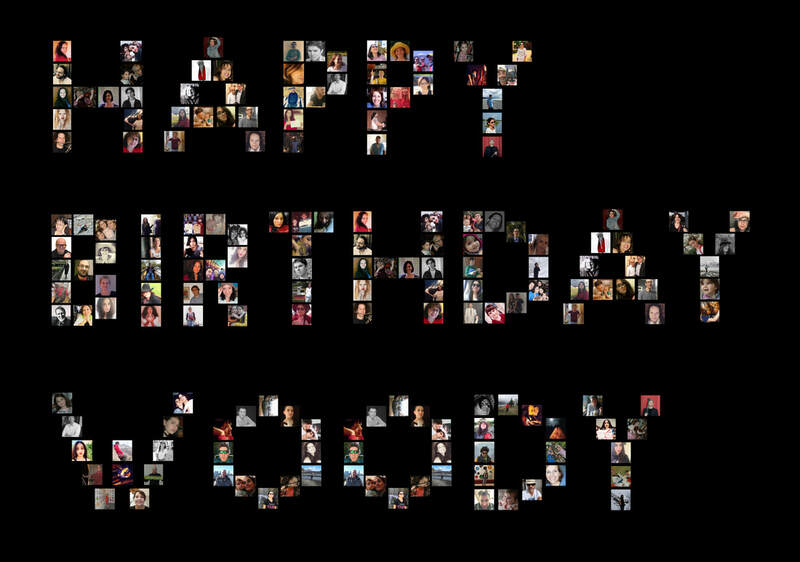 Many birthday wishes to you, dear Woody, from some of your fans from Australia, Belgium, Brazil, Canada, Chile, Colombia, Croatia, Cuba, Egypt, France, Germany, Greece, Israel, Iran, Italy, the Netherlands, New Zealand, Romania, Russia, Spain, Tunisia, Turkey, UK, Uruguay, and USA. Maryam Amiribehzadi. Accountant, mountaineer, ping pong player, Woody Allen movies lover. Tehran, Iran. Octavio Barros Vicuña. Uncle and great-uncle, smoker, bird and butterfly lover, stamp collector. Santiago de Chile, Chile. Flavia Bellu. Writer, cinephile, singer, baker, native New Yorker. Berkeley, CA, USA. Khashayar Boroomand. Philosophy PhD, Woody's fan, fond of music, cinema, and chess. Tehran, Iran. Souha Boughanmi. Woman, passionate for love, grateful to Woody Allen. Tunis, Tunisia. Dennis Brian. Screenwriter, completist, friend, Philosophy graduate. Green Valley, AZ, USA. Javier Camacho Cruz. Fine Arts teacher in Tokio, Japanese translator and modern Japanese literature lover. Jaén, Spain. Tindaro Capuano. Father of Ludovico, clarinet player as our friend Woody, swimmer (or at least I like to swim). Palermo, Italy. Patricia Casal Rodríguez. Passionate, curious, Foodle and nature lover. Vigo, Spain. Beto Caserio. Oboe player, uncle of three, music teacher, cinephile. São Paulo, Brazil. David Cerdá. Philosopher and writer who has seen all of Woody's films. Seville, Spain. Robert Chastain. Poet, artist, photographer, novelist. Longmont, CO, USA. Vasilis Chatzigeorgiou. Student, theater-goer, cinephile, book-lover, dreamer. Thessaloniki, Greece. Mireille Clees. "Mom" of two dogs, cinema, book, Woody and nature lover. Theux, Belgium. Victoria Corral Blázquez. Woman, mother, wife, consultant, passionate about the future. Madrid, Spain. Nadia Edwards. Emigrée, divorcée, Woody Allen passionée. Miami, FL, USA. Sophie Girardin. English teacher, 45, I watch Woody's movies again and again. Saint Étienne, France. Nina Gleize. Writer. Montréal, Canada. Anna Grau. Writer, reader, journalist, I interviewed Woody once! Madrid, Spain. Tussah Heera. Pianist, composer, writer, dreamer, and philosopher queen. Las Vegas, NV, USA. Marc Heller. Married, father, bi-polar, witty, under-achiever. London, UK. Sébastien Jacques. IT engineer and Woody Allen fan since the 80s. Paris, France. Michael Joseph. Poet, Robert Graves scholar, failed clarinetist, New Yorker, resist/persist! New York City, USA. Andrey V. Kalashnikov. Huge Woody Allen fan over a period of 25 years. Moscow, Russia. Danae Kardara. Philologist, writer, dreamer, romantic, and sarcastic. Karditsa, Greece. Hesham Khaled. Software developer, Woody movies addict, jazz junkie. Alexandria, Egypt. Polina Kiou. Fashion, movies and animal lover. Athens, Greece. Tempe Laver. Curious, stubborn, shy, middle aged. Brisbane, Australia. Scott Linker. Musician, father of Sabrina and two Yorkies. Las Vegas, NV, USA. Andrea Lukomski. Mom of two girls, teacher, dreamer, Woody Allen admirer, nature and animal lover. Vukovar, Croatia. Tom MacCammon. Musician, writer, supporter of Woody. Toronto, Canada. Hannes Minkema. Teacher, learner, father, son, musician, audience. Amsterdam, The Netherlands. Hesam Mohamadi. Engineer, philosopher, dreamer, writer, sleeper. Tehran, Iran. Mariana E. Montes. Psychiatrist and artist. There is more truth in poetry than in history. Montevideo, Uruguay. Pavlina Nelson. Mom, wife, cinephile, bookworm, nature lover. Prague, Czech Republic. Monica Nicolau. Book-movie-music-junkie, mathematician. San Francisco, USA. Kostas Papazafeiropoulos. Musician, composer, art lover, father of two. Athens, Greece. Adrian Pasarica. Software engineer by profession, Woody's fan by nature. Timisoara, Romania. Mar Pastor González. Book-eater, The Beatles, jazz and dog lover, Woody's fan. I love the films of the 40s, 50s, 60s, and 70s. Madrid, Spain. Olga Radulovic. Animal, music, and nature lover, vegan and cinephile. Woody's fan. Vukovar, Croatia. Hana Radulovic. Artist, caring, animal lover, sensitive and modest. Woody's fan. Vukovar, Croatia. Odalys Rey. Cuban, family, love, peace, happiness. Havana, Cuba..
Jacquelyn Roberts. Artist who serves Art. Tehachapi, CA, USA. Stéphan Sante. Musician, piano teacher, cinephile, Woody's fan. Verviers, Belgium. Billie Shankar. Woody Allen fan. Brussels, France. Carol Space. I love Café Society, Blue Jasmine, Midnight in Paris and Vicky, Cristina, Barcelona. Brewster, MA, USA. Ruth Streett. Mother and grandmother living in Jerusalem. Jerusalem, Israel. Eyal Streett. Father, musician, curious, cook, creative. Jerusalem. Israel. Yael Streett Tejeda. Musician, ballet and hip hop dancer, tae kwon do brown belt, painter, trilingual. Madrid, Spain. Itay Streett Tejeda. Writer, book-eater, chocolate lover, hip hop dancer, basketball player. Madrid, Spain. ​Dalit Streett Tejeda. Ballerina, violinist, recorder player, swimmer, ice cream lover. Madrid, Spain. Michael Taft. Book and music lover. Loves anything to do with Woody Allen. Christchurch, New Zealand. Ulrich Tangl. Basketball player, basketball coach, basketball organizer, ex-sports editor, single. Kirchheim unter Teck, Germany. Antonia Tejeda Barros. Mother of Yael, Itay and Dalit, musician, Philosophy MA, teacher, cinephile. Madrid, Spain. Moiz Terem. Woody's fan, book, film, and jazz lover, father of two. Tel Aviv, Israel. Marise Thomspson. Music, movies, history, animals, and Woody Allen lover. I love to laugh. Ohoka, New Zealand. María del Pilar Trujillo. Life lover, meat lover, wine lover, salsa music lover, Woody Allen art lover. Bogotá, Colombia. Elisabeth T. Walker. Inspirational artist-writer-performer-activist-mystic. New Haven, CT, USA. Gizem Yenikler. Writer, art, theatre and music lover, cinephile, traveller. Izmir, Turkey. Kiana Zanetti. Musician, poet, cinephile, Woody's fan. Montréal, Canada. Yulia Zharkaya. Founder of vk and Woody Allen fan. Saint Petersburg, Russia. Evelyne de Zilah. Student, cinephile, book-eater, discreet, thankful for Woody Allen's Art. Creuë, France.